Paris… A city in which you’d spend all your holidays, your whole year, and even… your whole life! But sometimes, you only have two days to visit the whole city. It is a very short amount of time, for sure. However, you’ll be surprised of how quickly you can make a full tour of the « city of love ». Let us guide you through the city! You won’t be disappointed by those 48 hours of discovery and fun! The weather is nice, the sun is rising, Paris is shining … It’s a good opportunity to have your breakfast on the most beautiful avenue in the world! – Le Starbucks (in french), located under the Arcades Avenue, offers a multitude of small, chic, trendy and sometimes luxurious boutiques, especially for shoes enthousiasts… There are tons of them to keep you busy! What we like: The touristic turmoil of the avenue. Whatever the time, it is always lively around here! What we love: Climbing up to the top of the Arc de Triomphe, either with the elevator, or the 284 stairs. You can go and visit the monument as soon as you’ve finished eating your breakfast, because the Arc de Triomphe is open for visitors from 10AM to 11PM, and between April 1st and September 30th. Once you finish your breakfast, go towards the Eiffel Tower. It’s a beautiful walk through the Champs de Mars and Trocadéro. 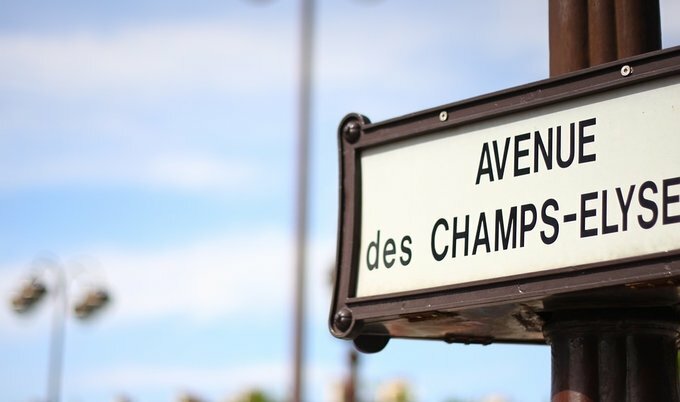 To get there from the Champs Elysées, take the Montaigne Avenue until the Pont de l’Alma. Walk along the Seine by the Avenue de New York until you reach the Place de Varsovie. From there, cross the Iéna bridge and you will arrive right under the Eiffel Tower. We promise it’s not that tiring! If you have enough time to go up, you will be amazed by the breath-taking views across the capital. Then , enjoy lunch in the area or take a walk on the Pont de l’Alma. So much physical activity will probably arouse your appetite… There, you will find small, typical and charming Parisian brasseries. What we like: The monument and its history! Also, it’s one of the most beautiful view you’ll have over the city of love! What we love: Sunbathing in the Trocadéro gardens or taking some rest in the grass of the Champ de Mars. However, be careful, there are always a lot of people! The Trocadéro is great indeed! But if you ever want to get some fresh air to arouse your appetite, we have something for you: why don’t you take a walk in the area of the Odéon, near Saint-Michel? This very famous neighbourhood, both fancy and young (it is the student district), is full of restaurants, pubs, cafés, breweries, and even fast-food restaurants for every taste and every budget! 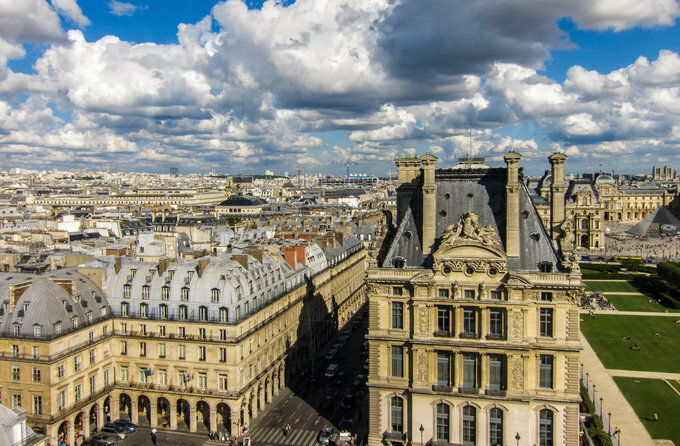 To go to the Latin Quarter from the Eiffel Tower, take the RER C at the Champs-de-Mars Tour Eiffel station and get down at Saint-Michel-Notre-Dame. It only takes 10 minutes and here you are! 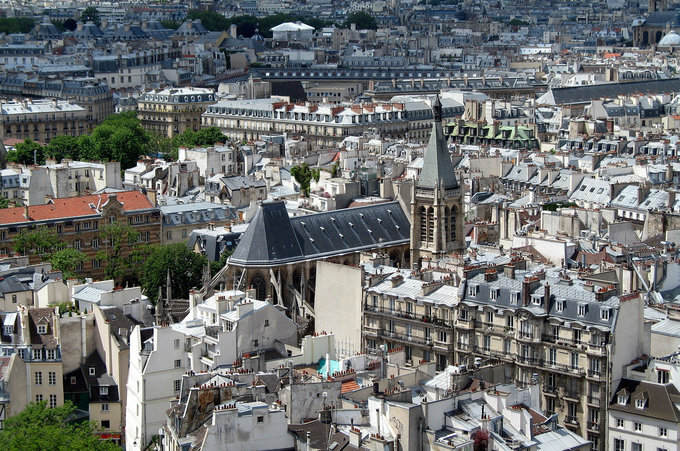 You can wander around on the forecourt of Notre-Dame-de-Paris, THE Parisian cathedral with its impressive gargoyles. You can walk along the Seine River banks, where you’ll meet typically Parisian booksellers. Then you shall go up to the Cluny museum (station Cluny-la-Sorbonne, RER B and metro line 10), to the Luxembourg garden or to the Panthéon. As for your growling stomach, you can pick either typically French restaurants such as crêpes houses or brasseries, or you can go for a more « exotic » food. We advise you to try two Latino-American restaurants: El Sol y la Luna (in french), which serves generous Mexican dishes in a very festive atmosphere, 31, rue Saint-Jacques: the price varies from 9 to 13 euros for a main dish, from 5 to 11 euros for a starter or a dessert. It faces competition from the also excellent and also Mexican Anahuacalli (in french). You can reach it from the Maubert-Mutualité metro station on line 10. It is located 30, rue des Bernardins. As a gourmet restaurant, the prices are higher: a main course costs approximately 20 euros. If you feel like a historian, you shall go up along the Saint-Germain Boulevard, to the Place de l’Odéon, and enter one small street from there: rue de l’Ancienne Comédie. Stop at number 13: you’ll discover a lovely place, the Procope, a relic from the 17th century. It was founded in 1686 by an Italian, Francesco Procopio dei Coltelli. It is one of the most ancient Parisian restaurants. Various French cultural and political personalities gathered there to eat, drink, and debate: Verlaine, Diderot, Rimbaud, Voltaire, Victor Hugo, Beaumarchais, Rousseau, Robespierre, among (many) others… The starter+main course menu is 21.50 euros, it is not that much when you realize how mythical the place is! 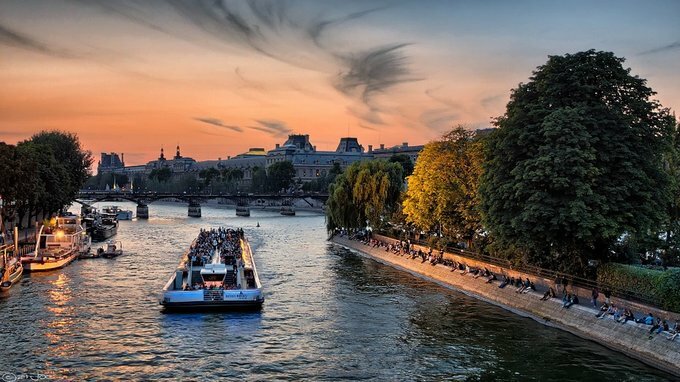 What we like: To sit on the Seine banks, enjoy the view and say « hi » to the bateaux-mouches riverboats. What we love: To rent a toy boat and let it navigate the waters of the Luxembourg garden pond. The children will be so happy! To go from Saint-Michel to the Louvre Museum is very simple: you can walk there! From Place Saint-Michel, go towards the river banks just ahead of you. Then walk on the Grands Augustins dock and then the Conti dock. A bit further you will turn right and cross the Pont des Arts. Once you crossed the Seine keep walking straight until the Place Carrée. There, you will be able to get in the Louvre Museum. 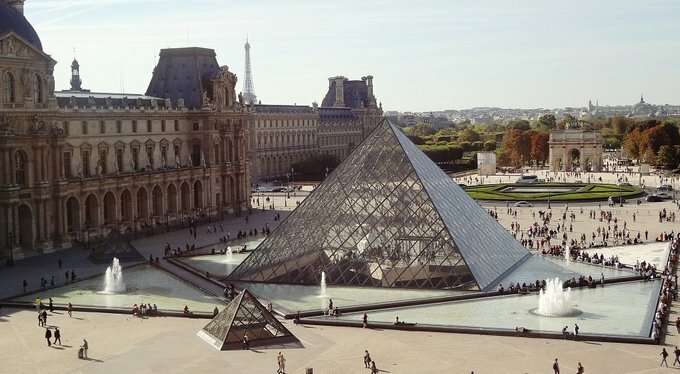 The Louvre museum might be the most famous Parisian museum in the world. It is also the most visited. In 2013 and 2014, the museum attracted 9 million visitors a year. At first, it was the palace of the royal family. The building started at the end of the 12th century. During the reign of Henry IV, in the 16th century, the Tuileries Palace was added to the former structure of the Louvre Palace. The Place Carrée as we know it today was built under the reign of Louis XIII and the construction ended under Louis XIV. It was only after the Revolution of 1789 that the project to turn the Louvre into a museum was launched. The glass pyramid was added by American architect Ming Pei at the end of the twentieth century. Tourists come here to see one particular work of art: Leonardo da Vinci’s Mona Lisa. But you must also come and admire the sarcophaguses of the Pharaos, the most beautiful Greco-Roman Antiquity statues, the works of Carvaggio, the art of Persia and Liberty Leading the People, the symbol of France revolutionary spirit … The museum’s collection gathers works from a very large period of time, from prehistory to 1848. After visiting the museum, book yourself a shopping session in the Carrousel du Louvre (Apple boutiques, Pandora, Lancel, Swatch, la Maison du chocolat …). See? We’ve thought of everything! What we like: Walking around the Palais Royal; 8, rue de Montpensier, to see the Colonnes de Buren. It’s a 7 minutes walk from the musuem and the Tuileries Garden. What we love: Lounging around in the sun in the Tuileries garden. During summer, you will enjoy the annual funfair: the entrance is free whereas the attractions are not. Feel like stretching your legs before dinner? Let’s go to a new neighbourhood, the Marais! Metro line 1 is very useful in this particular case, because you will easily have access to Saint-Paul or Hôtel de Ville metro stations and the Louvre museum. Take the metro once again at the following station: Tuileries, or Palais Royal Musée du Louvre, whether you’re just getting out of the museum or whether you’re leaving the Tuileries gardens. Stop at Saint-Paul, near Bastille, or at Hôtel de Ville, near Paris Town Hall. In both cases, you’ll have the possibility to reach the rue de Rivoli, the ideal place for some window-shopping. The Marais area comprises both the 3rd and the 4th districts (at least, partially). It is known for being particularly lively, for its various luxury stores and its second-hand shops, its bars (if you go to Bastille, you can have fun at the rue de Lappe), its art galleries (in the 3rd district you will find the Musée Picasso) and also for its Jewish community, whose kosher restaurants sell delicious dishes, like falafels. There you will admire the July Column in Bastille, go down the Seine River banks (crossing the Pont de Sully, between Sully-Morland metro station and Jussieu Paris VI University) or simply discover the very peaceful Place des Vosges, Paris oldest square. Apart from the historical dimension of the quarter, it is also interesting to look at its artistic dimension. In the Marais, you’ll find many art galleries (at least a dozen on the rue Saint-Paul) and photography galleries too. One of the main ones is the Maison Européenne de la Photographie (European House of Photography), at 5-7 rue de Fourny in the 4th district. It is accessible by train from the stations Saint-Paul on line 1, Pont Marie on line 7 and Hôtel de Ville on lines 1 and 11. Since it was built in 1996, this centre for contemporary photography gathered hundreds of thousands photographs from 1950 to current times. There are also numerous activities organized for children as well as adults. It closes at 7:45pm, which is ideal for a cultural outing before dinner. What we like: The river banks at Bastille, also known as Port de l’Arsenal. It connects the Place de la Bastille to the Quai de la Rapée, in the 12th district of Paris. It’s the ideal location for a walk during summer, as it is a spacious green area. What we love: French writer Victor Hugo’s Parisian house. 6, place des Vosges, in the 4th district. In each room, a depiction of a part of his life is shown. As we said earlier, we can access the Marais by going out at the metro station Bastille (lines 1, 5 and 8). So why not take this chance to explore the Bastille quarter, which borders several districts such as the 4th, the 11th and the 12th? Moreover, it’s getting late, and you might be a little hungry or thirsty? Great, because Bastille is the perfect place to fill your stomach up or to quench your thirst! This neighborhood is quite young and popular, always full of people during both day and night. In order to eat something, you might want to dine in a famous franchise. For example, there is the Paradis du Fruit (literally Fruit’s paradise, website in french) which is a restaurant chain dedicated to… fruit! It is located not far from the metro exit, at 12, place de la Bastille in the 11th district. You’ll find other Paradis du Fruit restaurants in Paris, for example, in Montparnasse or Opéra. You will taste salads or toasts (with salmon, chicken or broccoli), pan-fried mushrooms or parmesan waffles. As for dessert, you will taste a festival of flavors: frozen yogurt, cheesecake, many types of sherbets or a fruit fondue for two. It will cost you between 10 and 15 euros for a main dish. And if you’re not too hungry, you will be satisfied with a pita and/or a fruit cocktail. If you are an Asian cuisine enthusiast, you can take the boulevard Richard Lenoir (or take the train line 5 for 5 minutes until Oberkampf station), and there you will discover a renowned Japanese restaurant, Kushikatsu BON (in french), 24, rue Jean-Pierre Timbaud, 75011. This starred restaurant will offer you a refined cuisine, inspired by a traditional recipe from Osaka: the Kushikatsu, which are basically deep-fried breaded skewers made of shrimps, broccoli, beef and more, all coated in the chef’s special breadcrumbs recipe. You can be sure you will be eating unique specialty in Paris, despite the abundance of Japanese restaurants in the city. The dinner menu costs 58€. And also don’t forget to book a table since it’s a popular restaurant! If you want to go for a more “Parisian” style, you can go to the Maison Plisson (in french), which is located at 93, boulevard Beaumarchais, halfway between the metro stations Chemin Vert and Saint-Sébastien Froissart both on line 8 (or it is accessible in 10 minutes by foot from Bastille). You can eat there but also do your shopping at their grocery shop, their creamery, their greengrocer or you might just want to sit down for a cup of coffee. You can get your groceries delivered in Paris and its suburb. The products are all fresh and chosen meticulously, and you might want to try the numerous delicacies samples waiting for you there. What we like: Wandering in the 11th district between Bastille and Oberkampf looking for bars. Try the ignited vodka shots at Espit Chupitos, or if you look for a Latin place, you can taste tome tapas and other empanadas at the Onze Bar (in french). What we love: the bar La Fée Verte, 108, rue de la Roquette, 75011, with its Art Deco looks! And we cannot forget about its absinthe drinks (hence its name the “Fée Verte”, the Green Fairy). Don’t you want to make a small tour in the famous Montmartre district? Yes? Did we say small? Oh no, we meant big tour! Start with the I Love You Wall (located 50 meters from the metro station), then you can go to the Place du Tertre to watch its many artists (a must see for tourists) and that is where you can stop for a drink and enjoy the Parisian summer sun. From Place du Tertre take the Rue Norvins, make a turn on rue du Mont-Cenis and then get in the rue du Chevalier de la Barre to get to the Basilica of the Sacré Coeur. You can also enjoy boarding the Montmartre Funicular, or just climb the many steps up to the monument. Whether you are the sporty kind or the passive kind, both means of transportation are worth taking! – Au Pied du Sacré Cœur offers traditional French cuisine at very affordable price, around €10 for a full menu. – Le Coq Rico, a gourmet bistro located on the Butte Montmartre offering French cuisine with specialties in egg and poultry. Starting from €20 for a dish. – La Bonne Franquette, a typical bistro restaurant of the nineteenth century; it is also a wine bar, and a restaurant bar in the evening. €28 on average for a menu item. What we like: The view from the Sacré-Cœur! Have you come to Paris to visit or what?! What we love: The typical atmosphere of the Place du Tertre. Take the metro at Abbesses station and get off at Trinité d’Estienne d’Orves in order to do a shopping stopover at the Galeries Lafayette mall, located only 5 minutes away from the metro exit. 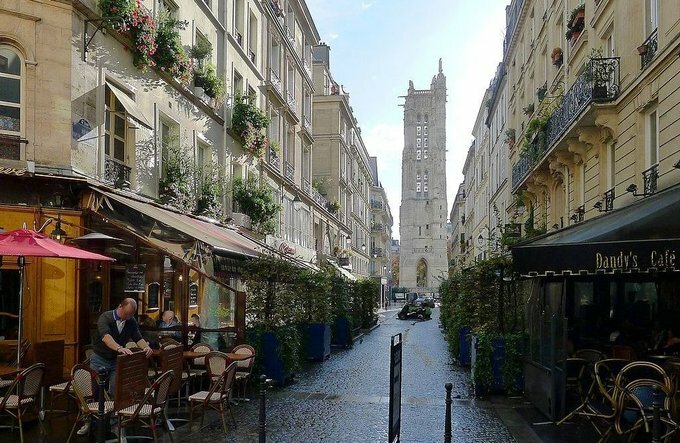 You can also wander around the neighbourhood of Saint-Lazare, which is filled with cafés and bars. The Opéra area is also a short distance away from Boulevard Haussmann. And if you’re feeling brave, you can walk along the boulevard up to the boulevards Montmartre and Poissonnière, in the very dynamic and youthful Grands Boulevards district. What we like: The shop windowsof of the Galeries which will enchant both children and grown-ups (especially during Christmas). A tourist attraction you cannot miss! What we love: Visiting the Opera Garnier in the day and watching ballets and operas at night! Book a visit of the Garnier Palace. When you’ll have enough of shopping and walking around, why not stop for a moment in a teahouse to taste some sweets. Of course, you know France for its wine and its cheese, and maybe you’ve heard about its pastries too! You’ll taste some French desserts in the lively quarter of the Sentier. For your tastebuds’ greatest pleasure, you should taste some “éclairs,” mainly some “éclairs au chocolat”! You can find them in the every Boulangeries of the capital city, or in other boutiques that exclusively bake them: the most famous one is Eclair de Génie (in french) which is established in different Parisian quarters such as Montorgueil, Odéon, Réaumur and the BHV Marais. If you wish to remain in the department stores in Haussmann, you can still taste these tasty éclairs with numerous flavors since they are being sold at Lafayette Gourmet at the Galeries Lafayette, from Monday to Saturday until 9:30pm. Do you like crêpes better? It is a dessert (or a savory dish) from Brittany that has conquered the whole world! At 3, rue des Ecouffes at Saint Paul (line 1), you will find Princess Crêpe that offers crêpes the way Japanese way in a very kitsch and pink location. They are rolled up and filled with whipped cream, fruits and ice creams; they can also be eaten in their cornet, which is ideal to eat and walk at the same time! You can also discover the very chic teahouse Angelina. The most famous boutique is at 226, rue de Rivoli, under the arcades right in front of the Tuileries Garden (accessible from the stations Tuileries or Concorde on line 1). But there is another one 108, rue du Bac, near the station Sèvres-Babylone (lines 10 and 12), and there are some more dispatched in Paris. You will be delighted by its specialty the Mont-Blanc, and other French specialties such Millefeuille, Macaroons or a Saint-Honoré… Hurry there to taste refined desserts in a refined place! What we like: The Cat Café (in french) at 9, rue Sedaine, 75011 near the station Bréguet-Sabin (line 5). Inspired by the Japanese concept, there you can eat and drink surrounded by cats. What we love: Ladurée thé&beauté, located just next to the Louvre (Métro station Palais Royal – Musée du Louvre lines 1 and 7), it offers hot teas and sweets at very reasonable prices. Time to spend on the boat: Between 1 and 3 hours, depending on the cruise you’re choosing. Make it 1h30 or 2hours more for the dinner. Go on a boat for a romantic, magical and unforgettable dinner on the Seine. You’ll embark at the Port de la Conférence, beside the Alma bridge, on the right bank of Paris, in the 8th district: you can get there by train; take the metro, line 9 (Alma-Marceau station) or the RER, line C (Pont de l’Alma station) or walk for 30 minutes! If you’re coming from the Galeries Lafayette, take the metro at Chaussée d’Antin – La Fayette station (line 9 again) and go straight to Alma-Marceau. What we like: The « Champagne cruise » during which you’re sipping Champagne whilst tasting some foie gras besides your dinner. What we love: Watching all the lights on the famous Parisian landmarks and bridges that were built through the centuries. Beware: the prices indicated above are valid at the moment when the article is written. If only have one day in Paris, check our article on a one-day itinerary ! And you prefer longer vacations, don’t hesitate to read this article about a week-long trip to Paris !